Some of the world?s most popular inventions were created by African-Americans, dating back to 1820, when Thomas Jennings, believed to be the first African-American inventor to receive a patent, created a more efficient dry cleaning process. Many years later, Judy W. Reed became the first African-American female inventor with her hand-operated dough kneader and roller. Reed, who was illiterate, signed the patent with an ?X.? Here?s a list of other items inventions by African-Americans. A specialized tool and procedure for the removal of cataracts, the Laserphaco Probe increased the accuracy and results of cataract surgery, previously performed manually with a mechanical grinder. Created with highly accurate laser technology, the Laserphaco Probe combines an optical laser, irrigation system and suction tubes. The laser vaporizes the cataracts and lens material via a 1-millimeter insertion into the patient?s eye and a replacement lens is inserted. Its use has helped restore the sight of several people who had been blinded by cataracts for up to 30 years. A fireman\oilman on the Michigan Central Railroad, Elijah McCoy was responsible for shoveling coal to keep the locomotive running and for ensuring that the train was well lubricated. He walked alongside the train, applying oil to the axles and bearings every few miles. To improve efficiency and eliminate the frequent stopping, he developed a ?lubricating cup? in 1872 that automatically dripped oil when and where needed. The ?lubricating cup? was so popular that orders for it came in from railroad companies nationwide. Other inventors tried to sell their own versions of the device, but most companies preferred ?the real McCoy,? ?giving rise to the popular American expression meaning the ?real thing.? As an apprentice in a shoe factory where he operated a sole-sewing machine, Jan Ernst Matzeliger was responsible for attaching different parts of a shoe together. At the time, no machines existed that could attach the upper part of a shoe to the sole, therefore it had to be done by hand. ?Hand Lasters? were able to produce approximately 50 pairs of shoes a day. In 1882, Matzeliger perfected a shoe lasting machine that was able to complete 150 to 700 pairs of shoes a day. By 1889 the demand of the shoe lasting machine was overwhelming and The Consolidated Lasting Machine Co. was formed, where Matzelinger was given huge blocks of stock for his invention. His machine had revolutionized the entire shoe industry in the U.S. and around the world. In 1912, Morgan created a Safety Hood and patented it as a Breathing Device, which later came to be known as the Gas Mask. Morgan?s Gas Mask consisted of a hood with two long tubes, one allowing in clean air and the other allowing the user to exhale air out of the hood. Fire and police departments across the country began placing orders. With the outbreak of World War I and the use of poisonous gases, Morgan’s Gas Mask was utilized by the United States Army, saving the lives of thousands of soldiers. Inventor: Mark Dean, Ph.D. (1957- ), holds three of IBM’s original nine PC patents and currently holds more than 20 total patents. After obtaining a bachelor?s degree in electrical engineering from the University of Tennessee, a master?s degree in electrical engineering from Florida Atlantic University and a Ph.D. in electrical engineering from Stanford, Mark Dean started working at IBM in 1980, where he was a chief engineer and instrumental in the invention of the Personal Computer (PC). He was instrumental in helping IBM make changes in areas ranging from the research and application of systems technology circuits to operating environments. One of his most recent computer inventions was the production of the 1-Gigahertz chip, which contains one million transistors and has nearly limitless potential. Granville T. Woods began work in a machine shop at age 10 and studied electrical and mechanical engineering from 1876 to 1878. Woods received his first patent in 1884 for a steam boiler furnace. In 1885 he invented a system called telegraphony, which allowed telegraph lines to carry voice signals. In 1887 he patented the induction telegraph for sending messages to and from moving trains. Other inventions for electric railways included electromechanical and electromagnetic brakes, a wheeled trolley for drawing power for streetcars from an overhead wires and a safety cutout to prevent injury from accidental contact with overhead wires. In 1890, with his brother, Lyates, he also patented emergency braking systems and devices relating to third-rail power. After a successful career as an Air Force and NASA scientist, Lonnie G. Johnson conceived his most famous invention in 1982, when he conducted an experiment at home on a heat pump that used water instead of Freon and as a result, his homemade nozzle shot a spray of water across the room. Johnson and his partner, Bruce D’Andrade, created a workable prototype of the SuperSoaker? in 1989 which became the world’s first high-performance, pressurized water gun. They filed for a joint patent, which was granted in 1991, and the SuperSoaker became the number-one selling toy in the country with more than $200 millions dollars in sales. 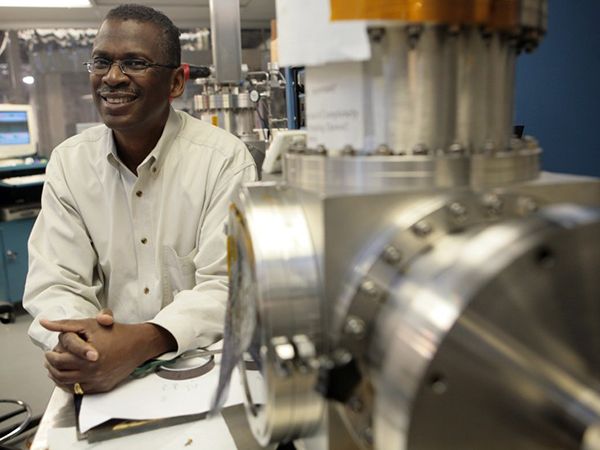 Overall, Johnson has earned more than 80 patents, with more than 20 pending. He continues to invent in the areas of thermo and fluid dynamics, as well as toys. Dr. Drew was a medical doctor and surgeon who created the idea of a blood bank and a system for the long-term preservation of blood plasma. His doctoral dissertation at Columbia University covered the condition of blood stored in blood banks and the method of storing blood as plasma to increase storage life. He later supervised the blood-plasma division of New York City’s Blood Transfusion Association, which was involved in collecting blood for the British Army. When America went to war in 1941, Dr. Drew was named as director of the blood bank for the National Research Council, collecting blood for the U.S. army and navy, and setting the groundwork for the Red Cross collecting and banking procedures. The storage of blood in plasma form has saved many lives since Dr. Drew brought the process forward in the 1930s. George Washington Carver is best known for developing crop rotation methods that alternated nitrate-producing legumes, such as peanuts and peas with cotton, which depletes soil of its nutrients. Following Carver?s lead, southern farmers soon began planting peanuts one year and cotton the next. While many of the peanuts were used to feed livestock, large surpluses quickly developed. Carver then developed more than 300 different uses for the extra peanuts, from cooking oil to printer?s ink. When he discovered that the sweet potato and the pecan also enriched depleted soils, Carver found more than 100 uses for sweet potatoes and about 75 for pecans, including synthetic rubber and material for paving highways. Chef George Crum spent the summer of 1853 working at the Moon Lake Lodge resort in Saratoga Springs, N.Y., where thickly cut, French fried potatoes were a popular menu item. When a customer complained that their fries were too thick to eat and sent them back to the kitchen, Crum became agitated and reacted by slicing the potatoes as thin as he possibly could, frying them and sending the crunchy brown chips back out to the guest. The guest loved the crisps and other guests began asking for them as well. They soon gained popularity and were called Crum?s Saratoga Chips. In 1860, when Crum opened his own restaurant, Crumbs House, each table came with a basket of potato chips. Crum never patented or attempted to distribute his potato chips, but has been credited as the creator of the widely popular snack.